7 inch entertainer. Creative launches entertainment tablets for little money with its ZiiO range. Despite the low price, the tablets are to be suitable for rendering HD media. In any case, a 1 GHz CPU does its job inside the small devices. The offer of available tablet computers is becoming continually vaster. In the meanwhile, tablets below a price of 300 euros are on the market. 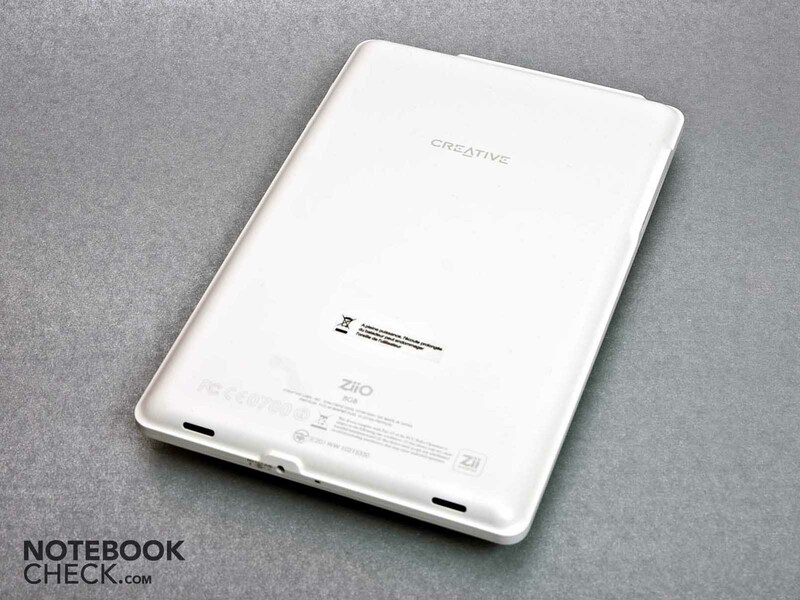 Creative is also among them with a few models in the tablet division. Creative calls this division "Entertainment Tablets", which already indicates what these models from Creative have been made for. The ZiiO family currently consists of two models, a 10 inch model and a 7 inch model. Both models are available with a memory capacity of 8 GB and 16 GB. 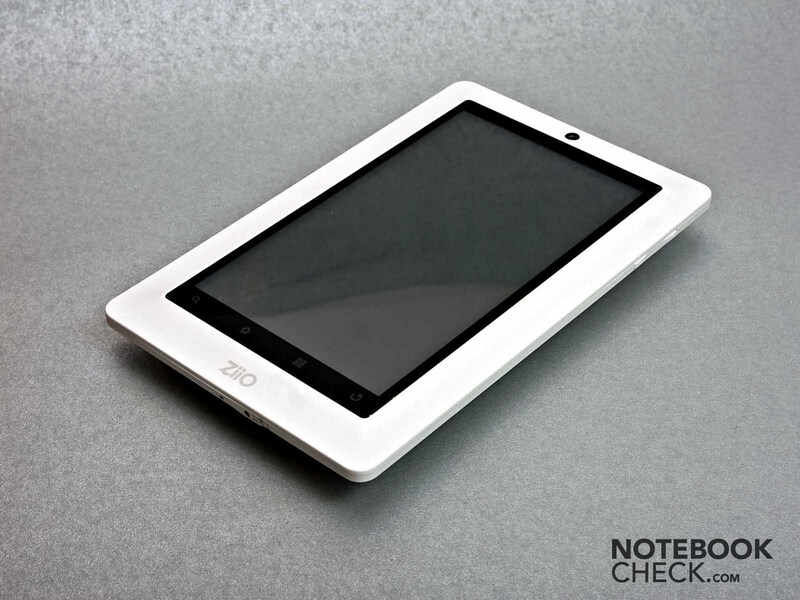 We have taken a closer look at the 7 inch model, Creative ZiiO 7", in this review. The design of our Creative tablet is pleasing. The white case together with the display's black bezel looks good. In our opinion, the display's positioning is particularly well thought-out. It is slightly higher than the rest of the case. The fingers find a secure hold on the edges beveled in this way, and thus the device is very safe and sound to hold. Merely the Creative logo is found on the smooth flipside. The power button for turning the device on/off or putting it in standby is on the top right edge. The rocker for volume control is found on the right side. Unfortunately, it doesn't fit quite tight in its socket. The tablet's workmanship is good, but still remote from that of the Apple iPad. Starting with choice of material up to manufacturing, the iPad is in the lead. Although the plastic used has been solidly manufactured, you don't have the feeling that you're really holding something of high quality. Especially on the flipside you notice that the plastic yields a bit when pressure is applied. However, we have to positively note that the case is resistant against fingerprints. In any event, fingerprints on the display are inevitable. For one thing, it's a matter of course for touchscreens, and on the other it's because the display doesn't have a special coating (the Apple iPad has an anti-grease finish). So, you have the feeling that you first distribute the fingerprints all over the display before they finally end up in the cloth when you're polishing it. The Creative ZiiO 7" can clearly score in terms of interface options. Beside a mini USB port, it also has a 3.5 millimeter jack, a microSD and an HDMI video out. Naturally, a built-in microphone and a power socket are also installed. While the mini USB port ensures the tablet's easy connecting to other computers, the HDMI socket provides a connection to larger TV sets. The Creative ZiiO is supposed to feed these with high definition videos without ado. If 8 GBs or 16 GBs aren't enough for you, you have the option of upgrading via a microSD card. The upper limit is 32 GBs here. That should be enough to even transfer larger music collections to the tablet PC. The Creative ZiiO has WLAN and Bluetooth available as wireless technologies. WLAN isn't really up to date with an 802.11 b/g standard, but is hardly noticed in the tablet. Bluetooth version 2.1 + EDR is installed. Additionally it has apt-X, A2DP and AVRCP. A2DP (advanced audio distribution profile) is a universal technology that allows audio signals to be transmitted wirelessly via Bluetooth. AVRCP (audio video remote control profile) is a Bluetooth profile that allows remote control of audio and video devices. The built-in acceleration sensor recognizes the device's position and thus can adjust the content according to the viewing direction. This is a bit slow though. The case is completely closed and there is no possibility to open it. Consequently, the user is denied access to the battery. Apart from the tablet itself, there is also a stylus, an adapter, a USB cable and the usual documentation materials in the box. It would have been nice if a HDMI cable had also been included for connecting the tablet PC to a TV. Since the Android market policies don't apply to the Creative ZiiO, it remains exempt from these. Although Creative supplies an own App store with the ZiiMarket, it isn't well-filled yet. However, you can exploit external App stores, such as AndroidPit or Canangie Market. Creative only grants a 1 year limited warranty on product parts and manufacturing. A tablet PC rises and falls with its touchscreen. If it isn't convincing, the best software or highest manufacturing quality can't save it. 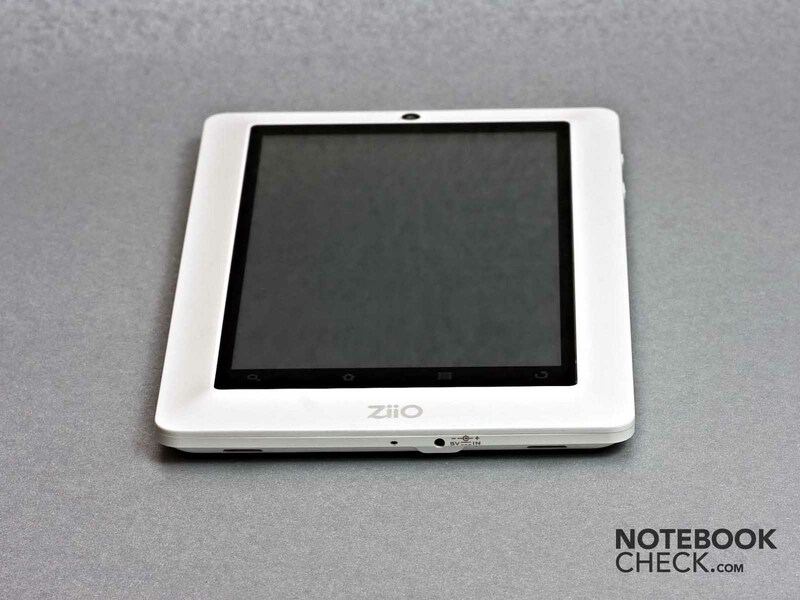 The Creative ZiiO is equipped with a resistive touchscreen. This is a process that detects touchscreen inputs by physical force. Two electrically conductive layers are pushed together by the applied pressure and thus can locate the position of input. In opposition, the Apple iPad has a capacitive touchscreen. It doesn't respond to pressure, but builds up an electrostatic field instead. The touch of a finger changes this field and the position can be determined. Unlike the resistive touchscreen, the capacitive touchscreen can't be operated with a stylus. The ZiiO's resistive touchscreen is inferior to the capacitive touchscreen of the iPad and partly responds slower, but all in all it makes a good impression. Scrolling through websites and pictures works well and even navigating in the menus or on the home screen hardly leaves anything to be desired. Merely, the screen's keyboard shows a slight weakness in accuracy. The wrong keys are frequently triggered. You also have to live without multi-touch in the ZiiO 7". 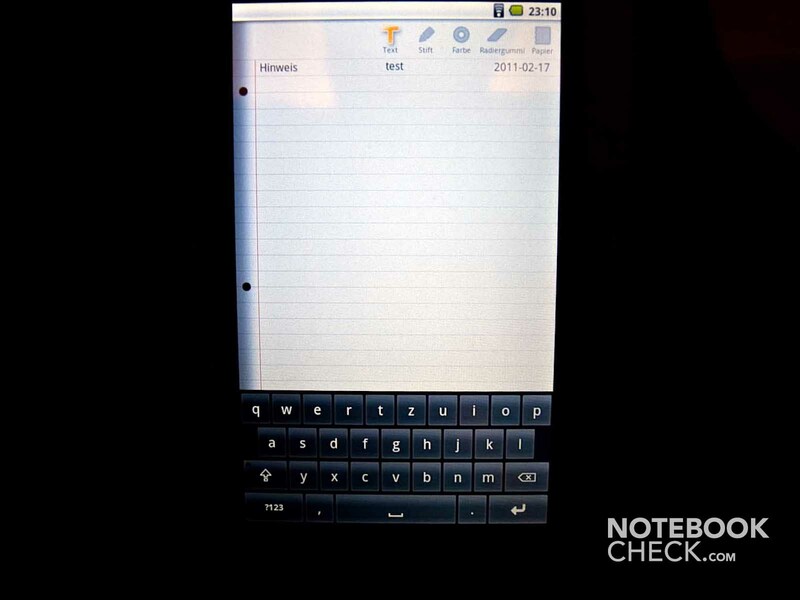 If you like, you can also fully switch to handwriting recognition via the stylus instead of the Android keyboard. Unfortunately, you have to figure out where to store it yourself since it can't be fastened to or inserted in the ZiiO. 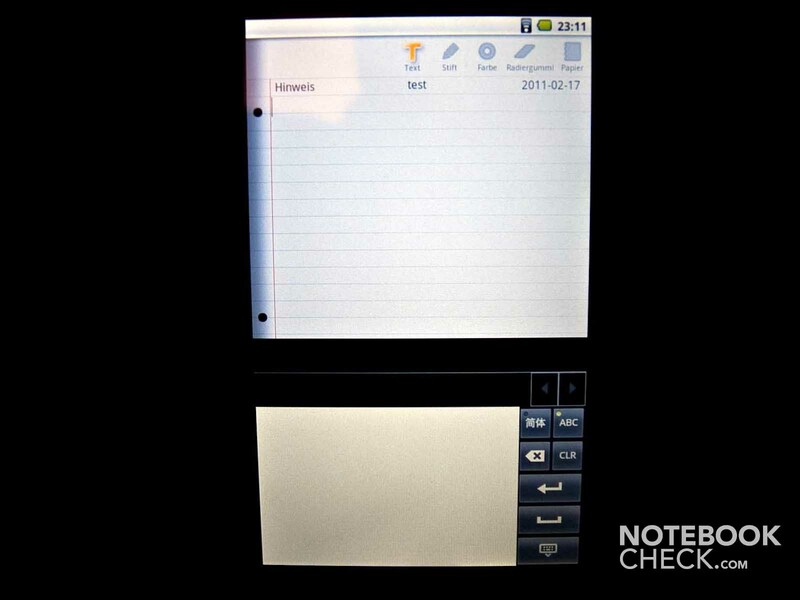 If you work without text detection, you can write digital notes very quickly. However, they would have to be copied or printed as a picture afterwards. Creative includes suitable software that is supposed to recognize written texts directly while writing. Unfortunately, it only works averagely at most. Many words are simply not identified correctly so that the software is not really of use. In the end, we preferred to use the tablet with the stylus and not our fingers. 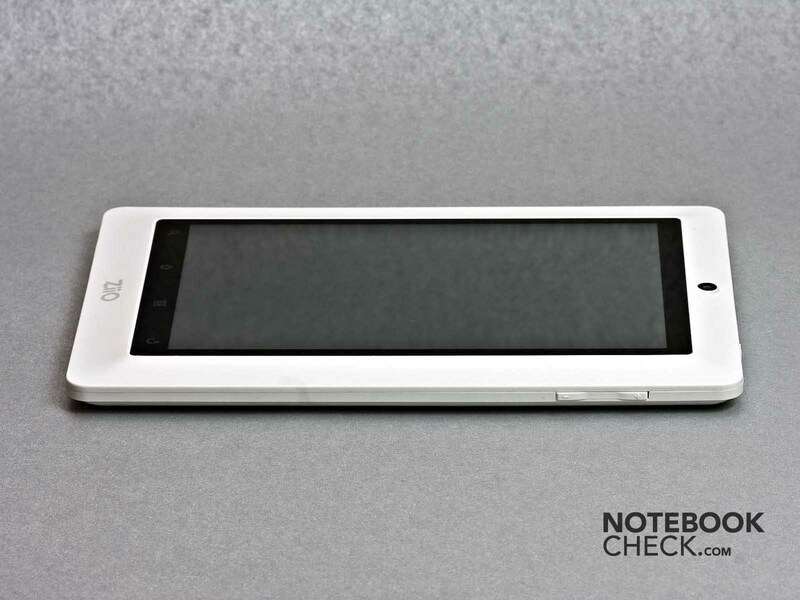 Creative relies on a resistive 7 inch touchscreen with a resolution of 480x800 pixels. 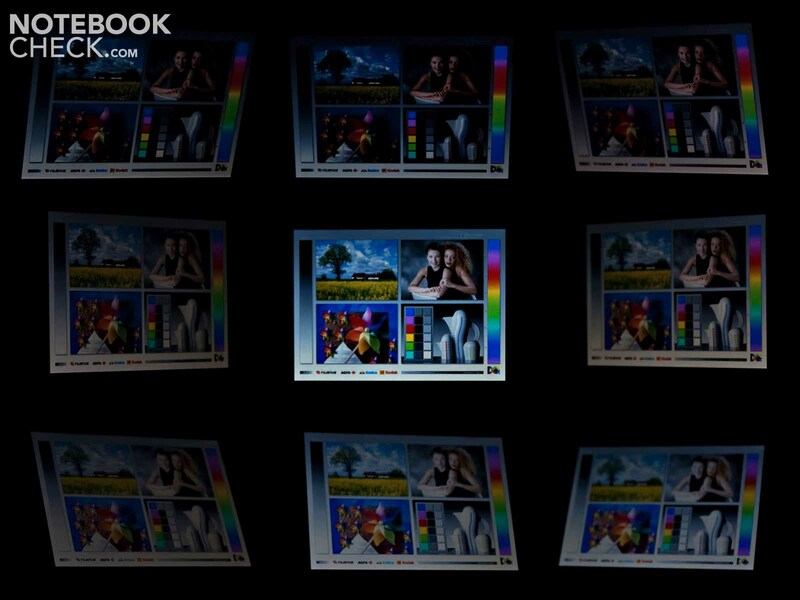 Surprisingly, the Creative ZiiO 7" provides very good brightness rates with a maximum of 328 cd/m2. The average rate of 308 cd/m2 is also still impressive. The tablet naturally also achieves these rates in battery mode and not only with the adapter. The black value of 1.23 cd/m2 could actually be a bit lower. However, if you consider the display's brightness, it is all right. The contrast nevertheless achieves an acceptable rate of 267:1 due to the good brightness. The image isn't as brilliant and razor sharp as in other tablet computers because of the layers covering the actual screen. The tablet has a hard time outdoors due to the reflective display. Even the display's good brightness can't completely make up for that. Intense reflections are already noticed in overcast conditions. Even if you can recognize contents from a fontal view, it should be almost impossible in direct sunlight. When the tablet PC is used in Landscape mode, changes first turn up at an angle of about 50 degrees horizontally and the image slightly bleaches. This happens somewhat earlier on the vertical plane, at about 35 degrees. IPS based displays (Apple iPad) also have a clear advantage here. 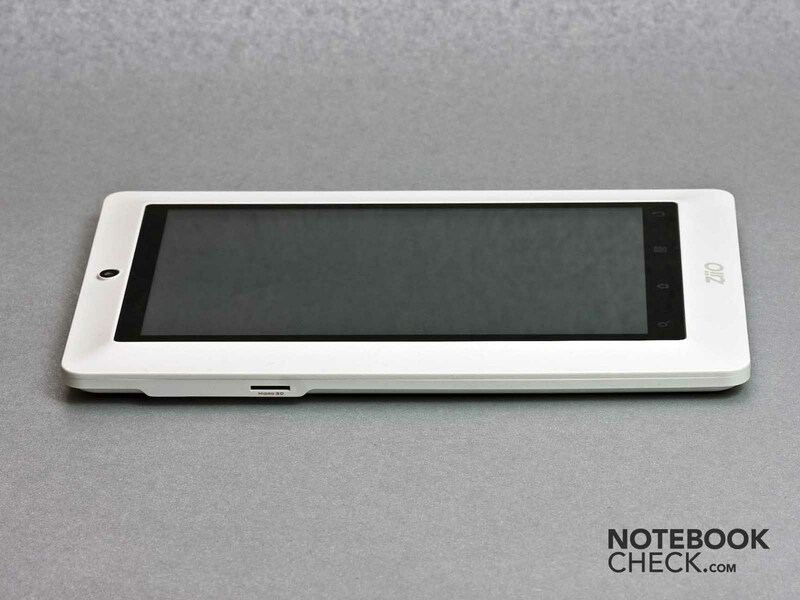 Creative has given the ZiiO tablets a Zii Labs ZMS-08 processor. It is an ARM Cortex HD Media Rich Applications processor with a clock rate of 1 GHz. A special trait of the ZMX-08 is that it can render FullHD (1080p) materials smoothly. Additionally, ARM processors are known to be particularly economic, which is why they are preferably built into tablets or smartphones. Since the Google Android platform (2.1 in ZiiO) isn't compatible with our standard benchmarks, we have to use other options for the Creative ZiiO 7". 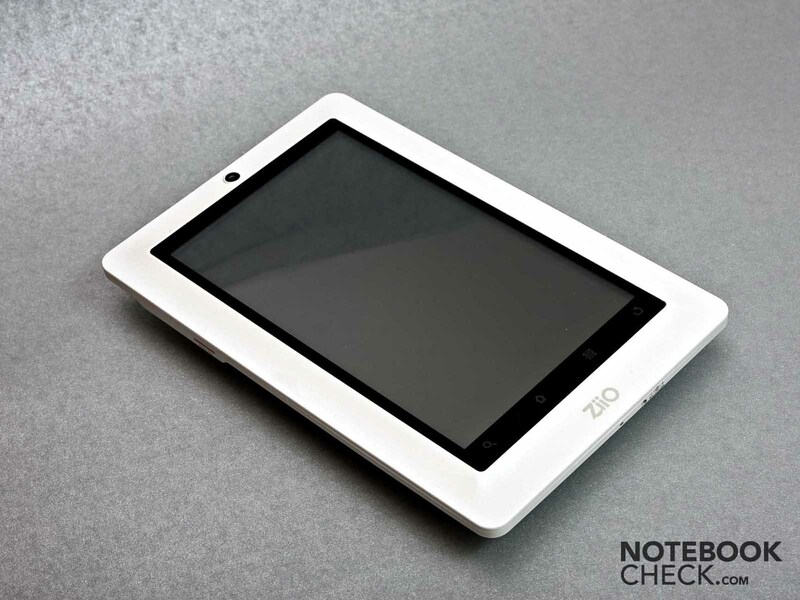 So we will also use the Quadrant Android Benchmark, as previously for the Toshiba Folio 100 and the Archos 101 tablet. The Creative ZiiO 7" even manages to break the record here – with a total score of 1830 points. Thus it surpasses the Folio 100 by almost 200 points (1631 points) and the Archos 101 by almost 600 points (1235 points). We fed the Creative ZiiO 7" with all kinds of movies in various resolutions for our test. Among others, our test classic "Big Buck Bunny" was used. This was rendered smoothly in HD Ready (720P) without complications. The Creative ZiiO 7" however stuttered with FullHD videos. Theoretically, the ZiiO 7" should actually be able to render FullHD (1080p) videos smoothly. The fact that other test movie sequences were rendered smoothly also proves this. It only stuttered every few seconds. Perhaps Creative wants to reserve a smooth FullHD (1080p) rendering for its 10 inch model, the ZiiO 10". Regrettably, movie entertainment via YouTube wasn't possible either, since the tablet PC doesn't get along with Flash despite the latest updates. Flash is currently only available for certified devices via the Android market. The included ZiiMarket doesn't yet have a really abundant choice of games and the ones available are usually simple in design. We thus still have to regrettably live without games that really challenge the tablet. At most, the App stores of third parties could be a remedy. Tablets aren't allowed to get too hot since you usually have to hold them in your hand. This is also usually not a problem because the installed hardware is designed for mobile use and only develops low waste heat. This is also the case for the ZiiO 7" that only reaches a maximum temperature of 32.7 degrees Celsius under load. However, the temperatures under load or in normal use don't differ much. The temperatures are far below 30 degrees Celsius for the most part and the tablet PC only heats up slightly. The tablet computer accomplishes the low temperatures with passive cooling only. Thus, it is completely noiseless, as well. (+) The average temperature for the upper side under maximal load is 24.5 °C / 76 F, compared to the average of 30.7 °C / 87 F for the devices in the class Tablet. (+) The maximum temperature on the upper side is 27 °C / 81 F, compared to the average of 34.8 °C / 95 F, ranging from 22.2 to 51.8 °C for the class Tablet. You notice that Creative actually comes from the field of entertainment electronics when hearing the tablet's sound qualities. The sound quality is very good for such a small device, except for the lack of bass. The built-in stereo speakers not only render videos and music clearly, but also sufficiently loud when required. As a rule, you should be able to use tablets for as long as possible without mains. The tablet lasts for a whole 11 hours and 34 minutes in idle mode. If you prefer using the tablet for watching movies, you can reckon with over 4 hours. However, it must be said that our test movie was a HD Ready version. The processor isn't put under as much load with lower definition versions, which should lead to even longer movie entertainment. At least, the ZiiO tablet lasted for 3 hours and 47 minutes of WLAN surfing. This is acceptable for notebook standards. Single tablets are even more successful here (Apple iPad up to 10h in WLAN mode). The energy demands explains the recorded battery life. 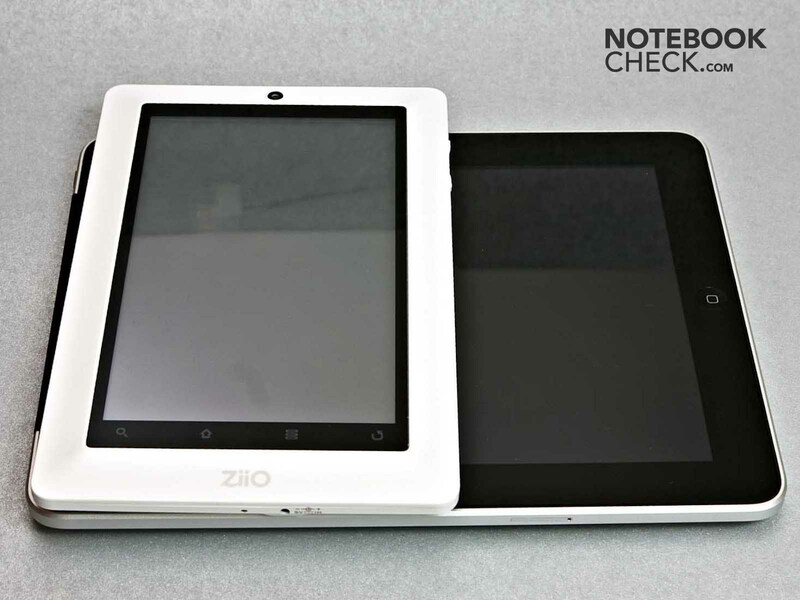 Compared to other Tablet PCs the Creative ZiiO is mid-range. E.g., the Toshiba Folio 100 demands less energy. 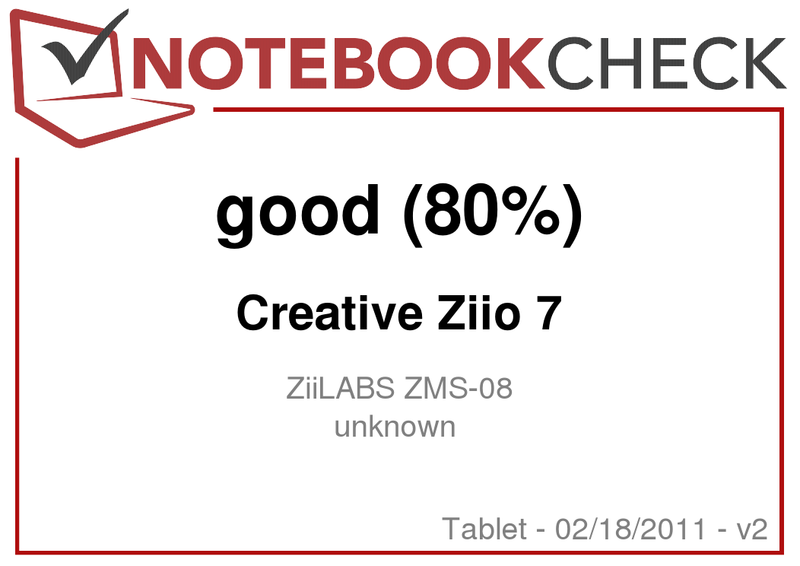 The Creative ZiiO 7" definitely doesn't belong to the verified "iPad Killers". But it's not trying to, either. All the same, you can get two Creative ZiiO 7"s with an 8 GB memory for the price of one iPad. In return, the Creative ZiiO 7" is rather more multimedia center. Considering the tablets possibilities of being connected to a TV via HDMI or wireless with the according audio speaker, it's still looking for its equals. Merely the resistive touchscreen and the old Android version dim the picture a bit. You get what you can expect for 249 euros from the case – namely plastic. However, it's been well-manufactured and is pleasant to hold thanks to its design. We can recommend the Creative ZiiO 7" multimedia tablet to those who find a smartphone too small and a 10" tablet too big. The tablet is simply more portable in view of its 7 inches, and handier than a 10" model in many situations. Also, if you put a lot of value on audio and video, you could be happy with the Creative ZiiO 7". Nevertheless, the lack of compatibility with Apps clouds the total impression to a great extent. The Creative ZiiO 7"s adapter. Smooth rendering of HD Ready (720o) videos and the good interaction of ZiiO 7 and TV set. The device's handiness was also convincing. 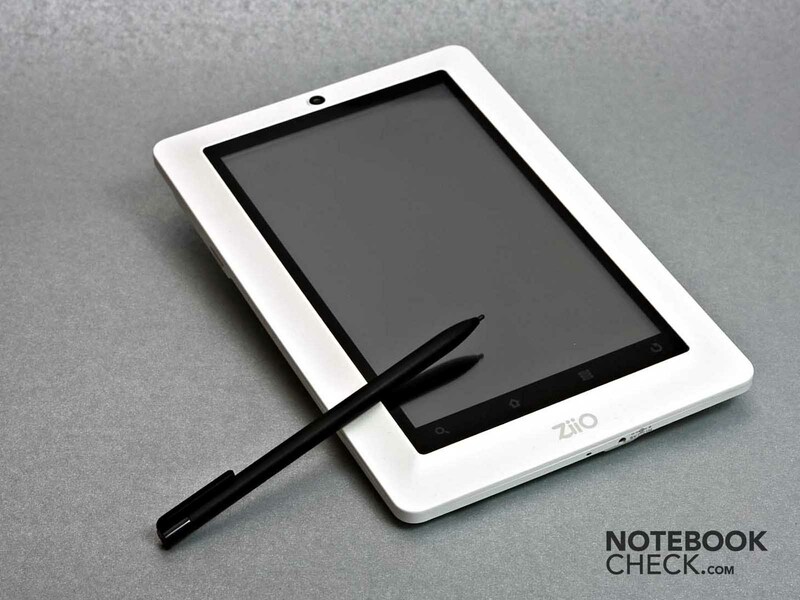 A capacitive touchscreen would have been very good for the ZiiO, even if it would have made it more expensive. Also, smooth FullHD rendering would have been a nice extra. 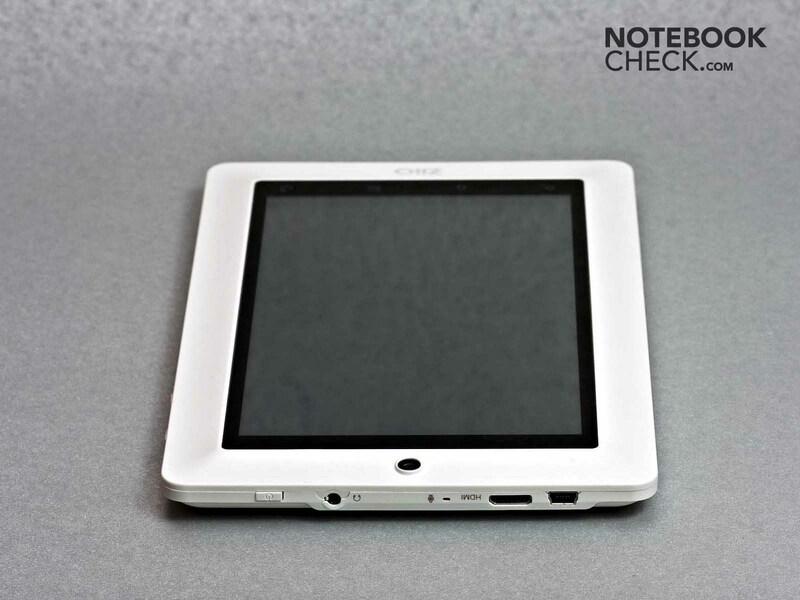 That the small tablet PC can render HD materials smoothly and even transmit it to large TV sets. The biggest rival in the 7" division is Samsung's Galaxy Tab. In addition to the tablet functions, you can even make telephone calls and write SMSs with it. However, it moves in a price range of Apple's iPad. 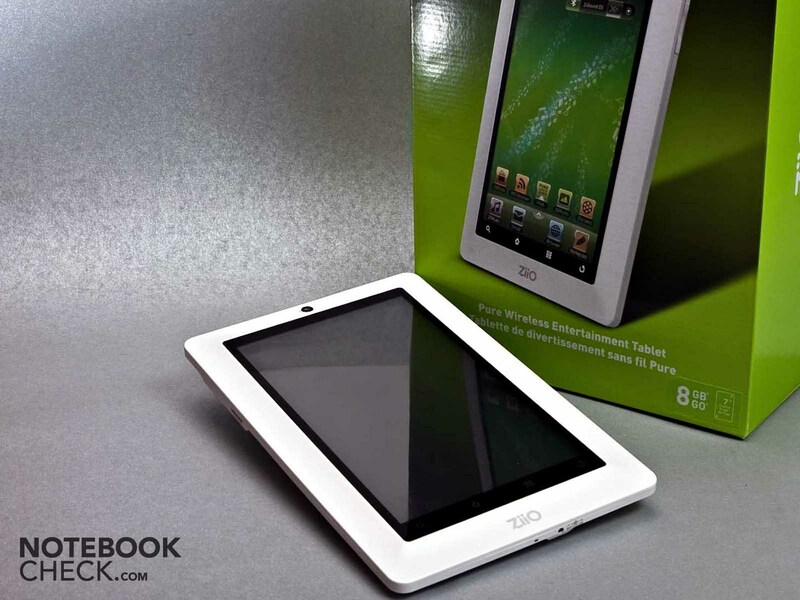 The Archos 101 Tablet is rather more in the ZiiO 7 price league. But then again it is a 10 inch tablet. In this case, it's better to take the tried and tested Apple iPad right away.